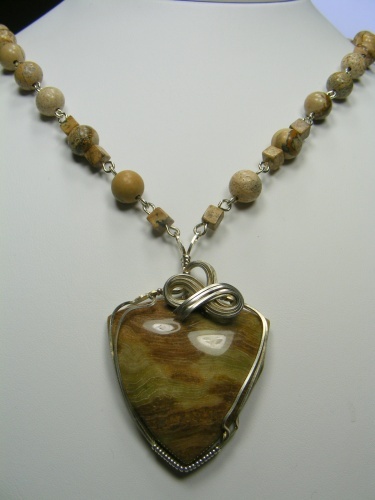 This pretty necklace is neutral in color with its beige gemstones of picture jasper and the focal of mushroom jasper that has been sculpted in luscious sterling silver curls. Has a sterling silver locking clasp. Elegance and simplicity for those of you who like the earthy tones, this is the one for you. Necklace measures 19" long and comes with a complimentary pair of earrings.